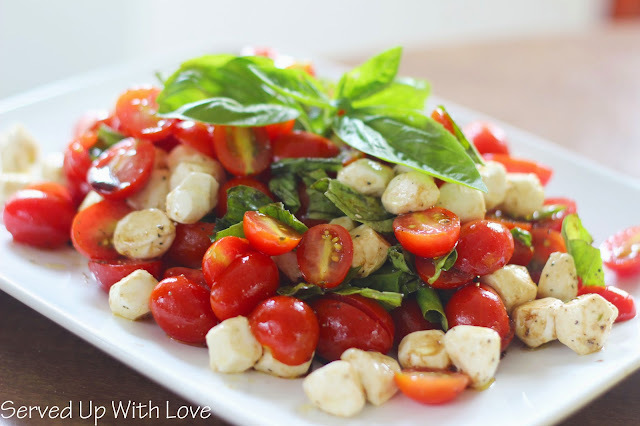 One of my favorite things about summer is a Caprese Salad. I could eat it every day and be happy. 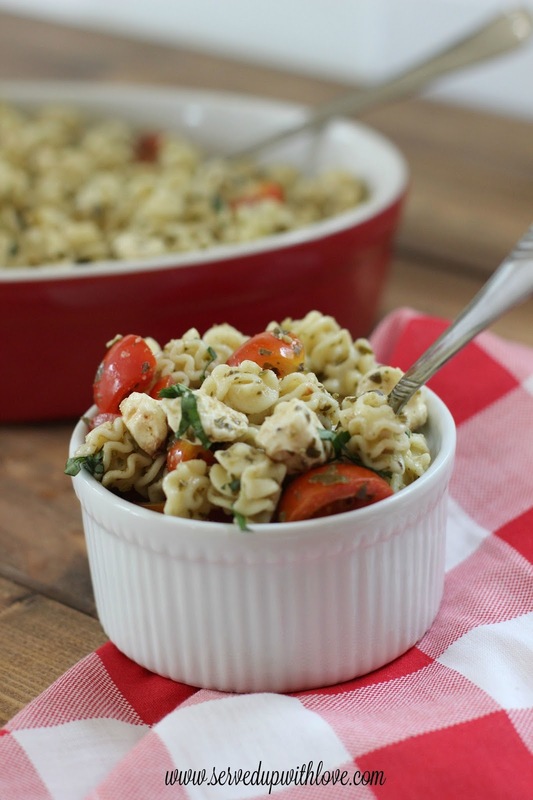 So I knew it was time to create a Caprese Pasta Salad with all those flavors that I love. This came together pretty quickly for our BBQ that we hosted for our son and his girlfriend. She loves Caprese Salad just as much as I do so I knew I just had to test it out on her. I think we both ate ourselves silly. Basil is one of those herbs that I have to have in my herb garden every year. I find myself picking from it every single day. Sometimes, I just go out and pick a few sprigs off the top just to make the air around me smell like basil. My husband is not as big of a fan as I am and always makes some silly comment every time he smells it while out in the yard. Silly man, you don't know what you are missing! Our cherry tomato plants have turned out to be regular tomato plants. I have never seen a cherry tomato that big so it must have been a boo boo! I was a little disappointed but oh well, we will just add those in with all the other tomatoes that are coming in nicely now (FINALLY) I will just have to visit a road side stand or the grocery store to buy those this year. Here is a little funny story, last year we had a cherry tomato plant pop up beside our kitchen door steps. We watered it, staked it, and wouldn't you know it, we had more tomatoes on that random plant than we did all the ones we planted. Only thing I can imagine is a cherry tomato must have fell to the ground the year before and it seeded. Or maybe a bird dropped it. Either way, we enjoyed those babies all summer! 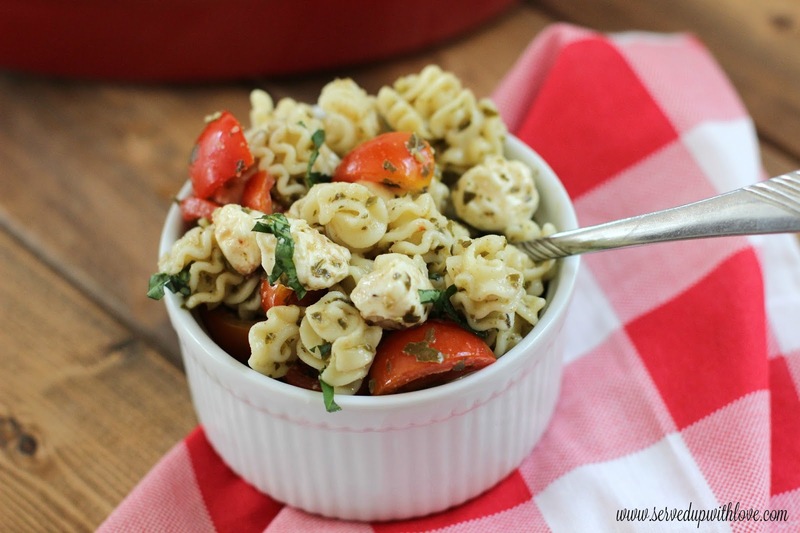 This Caprese Pasta Salad was declared a keeper with the family. Everyone loved it, well Mr. Picky Pants wouldn't try it, his loss! It is a must try this summer. 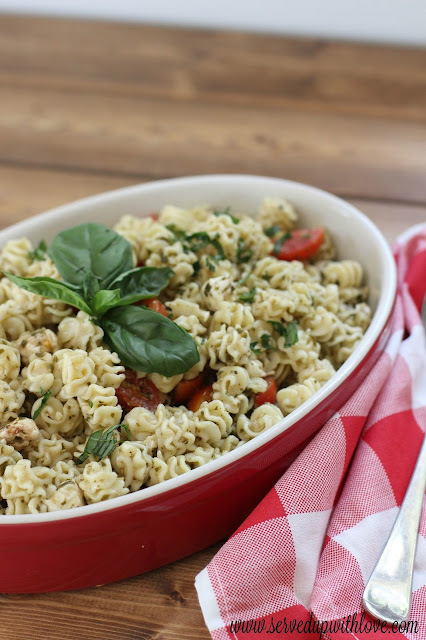 Stir basil, pesto, olive oil, and vinegar in a bowl until combined. 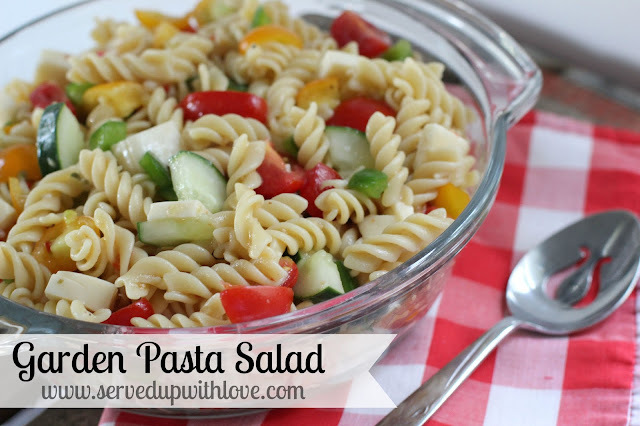 Stir into remaining ingredients in a large bowl and mix well. Cover and chill until ready to serve.